"Of course she's going to play the woman card. That's what she does." If we can just get past all of these distractions that have so far dominated the 2016 presidential race we can finally get to the issues. Issues. 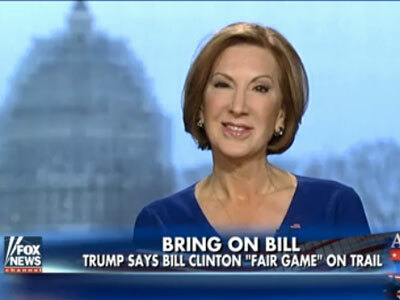 That’s what Carly Fiorina would really like to talk about. But not things like women’s issues, because being a woman shouldn’t be an issue, according to the GOP primary candidate. “I’m never going to ask for people’s support because I’m a woman. I’m going to ask for their support because I’m the most qualified candidate to beat Hillary Clinton and to do the job,” Fiorina said during an appearance this morning on Fox & Friends. What precipitated this discussion on running for president while female is (Surprise!) Donald Trump, who described in a Fox News interview Sunday some sort of card game the candidates are playing, for which one of the rules is in question, specifically, what happens when you play the woman card. Trump has a different strategy in mind, contending that Hillary Clinton’s use of the woman card during play triggers the Bill–Clinton-is-fair-game rule, in which any claims of misogyny leveraged against the candidates can be neutralized by bringing up the fact of Clinton’s association, by marriage, with Bill Clinton, someone who “demonstrated a penchant for sexism,” as per Trump. The rule dispute seems to center not on whether the Bill-Clinton-fair-game rule renders any claims of sexism irrelevant, but whether the rule can actually be employed. Hillary Clinton, first of all, calls everybody a sexist and that’s not fair game. She called Bernie Sanders a sexist because he criticized her. [If] she’s going to play that card we need to be realistic, and of course she’s going to talk about the Republican war on women, which doesn’t exist. In fact, Hillary Clinton’s policies are bad for women. But yes, Bill Clinton is fair game. But, my point is, attacking Bill Clinton won’t defeat Hillary Clinton. The only way to defeat Hillary Clinton is to attack Hillary Clinton’s track record. Maybe Donald Trump has difficulty doing that because his positions on key issues like health care are so close to Hillary Clinton’s. For takes on Fiorina’s brand of feminism, or whether or not that label is applicable to the candidate, check out NYT’s Room for Debate around the subject, featuring Linda Chavez, Donna Brazile et al.